Re: X - WALT DISNEY - One of his fingerprints shows an unusual characteristic! Notice how the upthrust absolutely abutts the horizontal ridge above it. Disney's own unique dermatoglyphic wonderland! Sorry Patti, can you point out for me: where exactly do your 4 new pictures present the (new) 'visual-info' that you pre-annouced??? By the way, in my screen your forum photos are displayed exactly how they are displayed via your website urls. And in all 4 pictures I can see the structure of the paper, so we agree that the quality of your pictures is excellent - though I never disupted that aspect of the 1933 pictures! 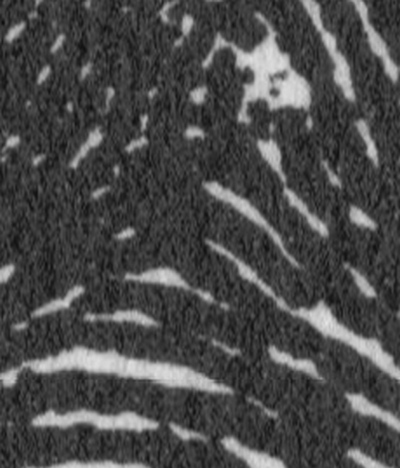 Unfortunately your new pictures do not not shed any new light on the problems resulting from the many RANDOM INK DOTS that occur 'between the ridges'; I pointed out to 10 of those RANDOM INK DOTS in that 1933 print in an earlier picture. Patti, I think so far you haven't responded on the issue of the RANDOM INK DOTS that I described for the 1933 print in the picture below. 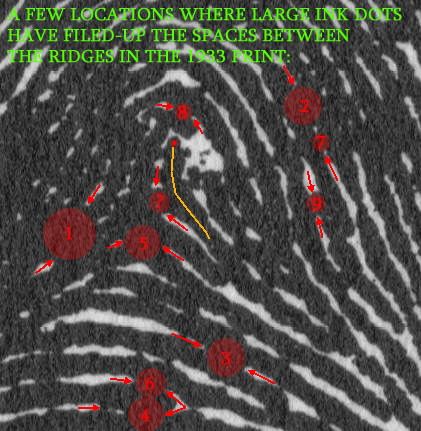 It appears that so far you did not recognize the presence of these RANDOM INK DOTS that occure at quite a few locations 'between the ridge lines'... am I correct on that? And if I am not correct: what is your thought regarding these RANDOM INK DOTS? I posted higher quality images. These are scanned from a lithograph. Again they speak for themselves. Please quit sidetracking the subject going off about blank spaces and ink smears. This is the nature of making ink prints. Even taking into consideration any bleeding of the ink, the ridge flow is still very obvious. Plain and simple, there is no loop! Period. I think you will only convince people inexperienced with dermatoglyphic development and formation to see a loop. ● When there are two or more possible deltas which conform to the definition, the one nearest the core is chosen. Prints are sometimes found wherein a single ridge enters the pattern area with two or more bifurcations opening toward the core. Figure 28 is an example of this. Ridge A enters the pattern area and bifurcates at points X and D. The bifurcation at D, which is the closer to the core, is the delta and conforms to the rule for deltas. A—A and B—B are the type lines. A bifurcation which does not conform to the definition should not be considered as a delta irrespective of its distance from the core. This would mean that even if there was a loop, which there isn't, the delta would be where the short upthrust at the center is located. Then even if there were a loop, there would be no ridge count and it would be disqualified. "The test is to trace the looping ridge toward the appendage, and if, when it is reached, the tracing may be continued as readily upon the appendage as upon the looping ridge, with no sudden, sharp change of direction, the recurve is sufficient. Figures 161 to 184 should be studied with this in mind." 1, 5 & 3 are most likely not overinked. It appears the ridges are so close to each they have merged. 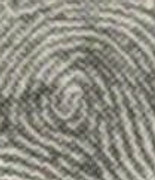 The color sample image above of a fingerprint shows near the whorl a place where the ridges are extra wide with a double layer of pores. This is what I see happening here. ?, is most likely a form of ridge. It is either an island - which has only one pore, or it's an interstitial ridge. An island is a valid ridge. An interstitial ridge would not count. I think I see a pore. In that groove between the upthrusting ridges, there is an evenly spaced pattern of these filling the space, as the space allowed. If there were more space they would have been larger, longer ridges. 8, I'm glad you brought 8 up. It's an interesting feature. Graphically it gives the appearance that the rising ridge if during development the horizontal ridge were not blocking the way would have continued right up the finger. There is a repeating dot in the groove in the next row up. There are at least two developmental factors being observed. The code for the print to have an arch and the code for a loop. The other hand's index finger is a small whorl with two triradii close to the center of the fingertip, but lowset. 2, 4, 9 & 6 look like ridges that are set very close together, could be ink. Not relevant as the pattern can still be followed in that area. There are two developmental factors being observed. The code for the print to have an arch and the code for a loop. The other hand's index finger is a small whorl with two triradii close to the center of the fingertip, but lowset. 2, 4 & 6 look like ridges that are set very close together, could be ink. Not relevant as the pattern can still be followed in that area. Excellent... these are very specified observations. Later I will consider the details & implications of your observations, and of course: if this issue could at least result in further agreement in your discussion! Okay, your assessment for points 1, 5 and 3 resulted in the conclusion that these LARGE INK DOTS most likely represent ridges that 'merge'. When ridges are merging (as in bifurcations) they converge towards eachother, and at the point where they have merged the width of the ridge line should be about the same as the width of the individual ridges... at least: that would be the typical characteristic in a HIGH QUALITY PRINT. 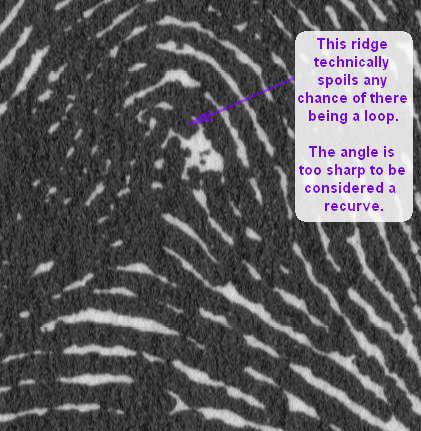 We can seen that the LARGE INK DOT appears to be even wider than the 'summary ridge width' of the 2 ridges involved. And a likewise phenomenon is seen in point 1 and 5. The manifestation of a short ridge line between both 2 parallel ridge lines. The connecting ridge line should then manifest as an extra ridge line which typically merges with both ridge lines at two different points (each point becomes manifest in a different region in the path of only one of the two ridge lines). But such a phenomenon would take a much large zone of both ridges lines than the amount of space seen inside the three LARGE INK DOTS. So, this option is unlikely as well. 2 - Both 1937 prints show evidence that at point 1, 5 and 3 the ridges simply continue their path; there is clearly an open space between the two ridges involved in all three points. Patti, all three points (1, 5 and 3) gave you the impression of 'merging ridges'. But I have just described that for the two reasons why I think it is completely unlikely that these LARGE INK DOTS reflect the presence of 'merging ridge lines'. And from these considerations I conclude that the 1933 print provide misleading clues regarding the nature of those three LARGE INK DOTS (point 1, 5 and 3). Patti, how does this so far sound to you? Can we find an agreement on my conclusion that the 1933 print does include some 'misleading clues'? I hope we can agree that at least at some locations in the 1933 there is too much ink involved, resulting in that we can clearly see how the ridges lines follow their path exactly. Again, in my former post I have described how from my point of view the 1933 print presents misleading evidence regarding the path of the ridge lines in point 1, 5 and 3. This is confirmed by all 3 pictures that I shared in that post because the other prints suggest that there are empty spaces between the ridges involved, which are filled-up with ink in the 1933 print. Now, regarding the new point that you introduce - the 'angle' of the ridge above the core - that could have been an interesting point for consideration if we had been confronted with a HIGH QUALITY PRINT. But in this discussion I have described quite a few observations (e.g. the 'large white zone', the '8 pointed star', and the three points 1, 5 and 3) which indicate that we are here faced with print that present a questionable quality. And therefore it is not unlikely that '90 degrees' angle - which I can observe as well - is only just another misleading clue.... especially because there is evidence in all three prints(!) 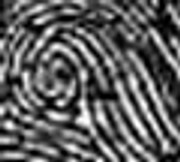 that in that zone of the fingerprint there could have a VERTICAL/OBLIQUE LINE (= not a ridge line!!!) which appears to cross 3 skin ridges: in the light 1937 you can see this VERTICAL/OBLIQUE LINE manifest in a white line!!! While n the dark 1937 print is manifests as a black line which appears to continue until the 'core'. NOTICE: I consider INK DOT 8 as a manifestation of the VERTICAL/OBLIQUE LINE that I mentioned. And we can see a likewise phenomenon - HORZONTAL LINE - which crosses INK DOT 7 (I already described that line in one of my earlier pictures, see below). 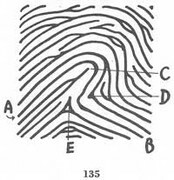 3 - the 'upthrust' is created by a horizontal line in the fingerprint that was filled up with due to the abundance of ink. Any, I hope that these considerations illustrates again that in this 1933 many characteristics are questionable. 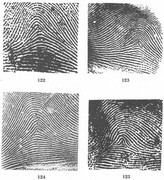 And especially concerning the characteristics that are not (clearly) seen in the other prints at all... we should better avoid using them as a decisive element for the assessment of this fingerprint. And because the 'angle' is not seen in the two 1937 prints, my conclusion is that we better exclude that element in our considerations for the 1933 print. Patti, can you agree with me on this conclusion? An Upthrust creates a tented arch. There are two upthrusts. Pick either one. When there is question about the location of the delta when there are more than one possibility, the closest to the core is chosen. In this print, using this guideline, there is no ridge count for a loop. I have seen many prints on live humans that have a slight superimposing of a second print. Even have a sample somewhere where I took a photo. I would think any palm reader studying detail will have seen the same thing. It's not that uncommon. 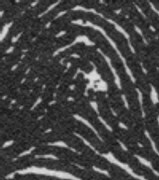 Some of the features you wish to disregard, are natural inherent features of Walt Disney's fingerprint. Studying his other fingerprints are helpful. Ranald's book has a pretty good print of the right hand and it's fingerprints. The facts speak for themselves. Your nitpicking and sidetracking over minor flaws, if they are flaws, that really do not matter in the discussion of a radial loop or tented arch, is really just a wordy distraction from the facts. p.s. The horizontal line you think is going through the upthrust would have to be considered an abuttment. They too can technically be said to make a 90 degree angle to the upthrust. Then the rule I wrote above from the FBI if the appendage could be traced without a sharp angle they can be considered to flow together. These minor details of Disney's print do not negate or change it's outcome these horizontal features you have drawn do not flow with anything but themselves. I can find plenty of support from the FBI book that supports a tented arch. I have not seen one quote from you from this source that supports your agenda. And because the 'angle' is not seen in the two 1937 prints, my conclusion is that we better exclude that element in our considerations for the 1933 print. [b] Patti, can you agree with me on this conclusion? 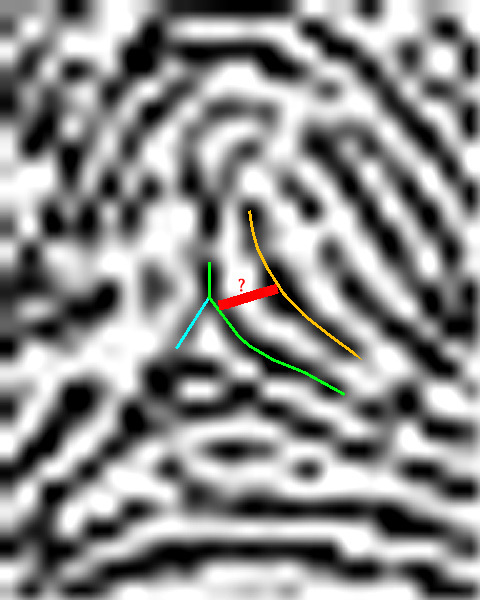 Anyway, when I look at the details of all 3 fingerprints that we collected for the left index finger (see the picture below), then I can observed a 'triradius' + a loop ridge line (around the red ridge line, the termination of that line represents the 'core' in this fingerprint: which results in: 'ridge count' = 1). Your newly drawn red lines can be seen in the 1937 image on the left. Particularly the bottom one. okay, I'm sorry, I just can't help it!! Are you really wanting us to think of an *upthrust* as horizontal??? Earlier you try to convince me the white space actually has something there. Now you want to convince me that a black mark is really because something isn't there. I may be called a palm reader but you sir, are an illusionist. Hi Martijin (the illusionist) and Patti (the palmreader), Beginning to sound like Walt Disney characters. Seriously, as one of you said it is a pity no one else has come in on this, meaning some one who knows about this. However, what I am thinking is do either of you not know some one you could ask who could come in as an independant. Yes, your observation also explains why on the left side of the green triradius in that center-picture some ridges appear to have disappeared...!! But we can see here the effect of the HORIZONTAL LINE... could also be responsible for creating 'your upthrust'... which without the horizontal line only could have been there if there had been a line that is actually quite UNATURAL: see the red line in the picture below. Patti, I know... we disagree about almost anything that we discussed. But can I ask you one more time to read the following 4 points carefully... please? Patti, you appear to assume that it is just coincidence that we not see that line in the light 1937 picture, but such a line is rather unusual, because it concerns a line that is positioned at a right angle (about 90 degrees) at the GREEN LINE. Patti I noticed: In your pictue (see below) you drew a pink line... but the slightly downward curving 'direction' of your pink line ... CAN NOT CLEARLY BE SEEN in any of the 2 pictures. But I can understand why you want to perceive the direction of that line in this way. I understand how the presence of the red line could be associated with the blue line... but it is quite unlikely that there can be any connection between the red line and the blue line... because the path of the green is very clear and would then be crossed by the other two lines! Afterall... as you know: ridges do not cross!! And triradii with 4 clear ridges involved... are never seen at all! For example, you assumed that the 'core ridge line' can be described as an upthrust - but this is actually a CLEAR VIOLATION of how the upthrust is defined in the book!!! "An upthrust is an ending ridge of any length rising at a sufficient degree from the horizontal plane, i.e., 45 degrees of more." Patti, the definition in the book clearly describes that an 'upthrust' is found at the HORIZONTAL PLANE of the fingerprint!! But the oblique, upward curving green line (see the picture above) can simply not be a part of the HORIZONTAL PLANE ... for the obvious reason: it concerns an upward curving ridge!!! 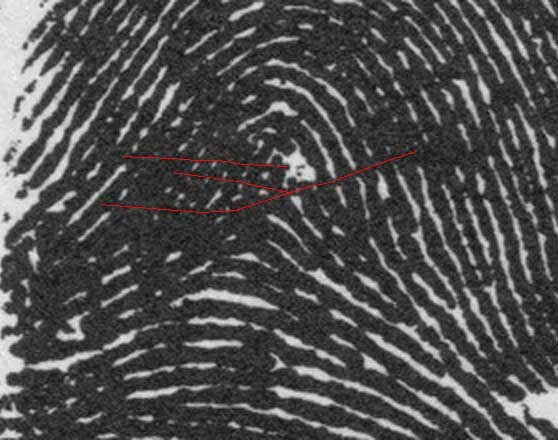 So the HORIZONTAL PLANE of this fingerprint is definitely found below that green line: because obviously... this line itself does not form any part of the HORIZONTAL PLANE!!! "In figures 159 and 160, there are ending ridges rising at about the same degree from the horizontal plane." The HORIZONTAL PLANE concern ridge lines which follow sort of a 'horizontal' path...but the green line (see my picture above) is obviously a typical ridge line that makes a curve that is nearly always seen in a LOOP. And of course: 'looping ridges' are NEVER EVER part of the HORIZONTAL PLANE. Patti, you tried to illustrate both your FIRST UPTHRUST and your SECOND UPTHRUST (which is pointed at the green line in my former picture) with purple arrows in the picture below. But your SECOND UPTHRUST does not only violate the upthrust-definition regarding that is does not connect to the HORIZONTAL PLANE... it also doesn't include the other major aspect in the definition: it does not end at all!! - And if you consider that it ends in the 'down curve' inside the red circle... I am 100% sure that example 155 in the F.B.I. book should make you understand that this is simply not how any 'upthrust' can be created. By the way, the same example 155 also confirms very explicitely why I have suggested that we can simply ignore any small white spots in the 'curving ridge line' - If you consider that properly, then you will probably also understand that it would at least be appropriate to stop calling me an 'illustionist'!!! PS. So far I had never quoted from the book, but I did describe with words + visual illustrations that my assessment does show all 3 aspects described in the F.B.I. book for a loop. Patti, it was probably your focuss on 'your upthrusts' that made you use subjective claims regarding your experience... and that I was only nitpicking & sidetracking on minor flaws. Now that I demonstrated how your observations actually violate the definition of the 'upthrust' in the F.B.I. book, I conclude that your assessment is not only build on misperceptions regarding the 'misleading' flaws in especially the 1933 prints (of course I should blame you for that because I am very aware how confusing certain elements in many fingerprints can be). Patti, if you had tried to find in 'The Science of Fingerprints' an upthrust that is positioned above an upward curving ridge line (the green line in my picture)... then you had discovered that such a combination is not possible at all!! Dear partner... I honestly hope that you will be able to digest my feedback on 'your upthrusts' + the elements in the book's definition, with a balanced state of mind. "Earlier you try to convince me the white space actually has something there. Now you want to convince me that a black mark is really because something isn't there." PS. Regarding your rethorics, I would never describe myself as an illusionist... because I don't like to fool-around with people's minds at all. Instead, in this discussion I actually 'cracked' some visual illusions that were induced by 2 of the 3 prints prints... strangly so far you appear to be the only victim of those. The upthrust rule you describe regarding that it must only be a horizontal plane is incorrect. Didn't you notice all the examples in the book and the website with upthrusts at the top of a looping ridge? That made a looping ridge in some cases a tented arch. Obviously not a horizontal plane. I think you are misunderstanding what you have read and not reading enough. You have been unable to talk me into seeing a radial loop. But when I worked my way through your numbered dots last night, I noticed that some of those markings actually formed a pattern of a whorl. I mentioned that. 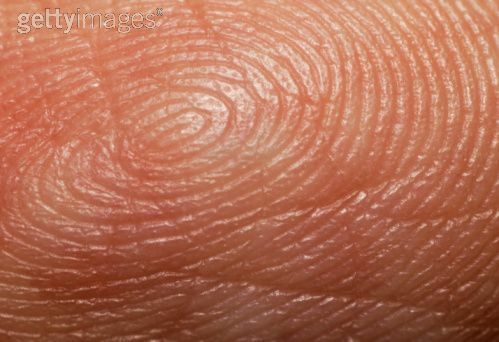 I think it will be of great value to study the right index finger print. There is a small single ridge spiral at the very core of the whorl. Note the angular formation of this central pattern. See the darker horizontal ridge and the upthrust like pattern. This I believe is what we are seeing in the left index finger. Perhaps in development the core began following directions for a whorl and arch like ridges entering from the sides forced the pattern we are intensely discussing. ● The type in which ridges at the center form a definite angle; i.e., 90° or less. ● The type in which one or more ridges at the center form an upthrust. An upthrust is an ending ridge of any length rising at a sufficient degree from the horizontal plane; i.e., 45° or more. ● The type approaching the loop type, possessing two of the basic or essential characteristics of the loop, but lacking the third. Figures 122 to 133 are examples of the tented arch. Figure 135 is a sketch of a pattern reflecting a ridge, A—B, entering on one side of the impression, recurving, and making its exit on the other side of the impression. The reader should study this sketch carefully. It should be borne in mind that there must be a ridge entering on one side of the impression and recurving in order to make its exit on the same side from which it entered, or having a tendency to make its exit on that side, before a pattern can be considered for possible classification as a loop. This pattern is a tented arch of the upthrust type. The upthrust is C. There is also an angle at E. D cannot be termed as a delta, as the ridge to the left of D cannot be considered a type line because it does not diverge from the ridge to the right of D but turns and goes in the same direction. Figure 149 is a tented arch because of the upthrust present at the center of the pattern. The presence of the slightest upthrust at the center of the impression is enough to make a pattern a tented arch. I've had to use another source today. But it's too many steps. An upthrust, then, must not only be an ending ridge rising at a sufficient degree from the horizontal plane, but there must also be a space between the ending ridge and the ridge immediately beneath it. This, however, is not necessary for a short upthrust or spike, or any upthrust which rises perpendicularly. I believe what is being called the "horizontal plane" is where the ridges under the pattern cross over from side to side without flowing over the top of the pattern. Or when you are drawing type lines, the line at the bottom of the arch pattern that does not curve around as a loop or a whorl. The upthrust has to be located between the arching ridges above the central pattern and horizontal ridges below. Not just anywhere on the fingerprint. jeanette wrote: Hi Martijin (the illusionist) and Patti (the palmreader), Beginning to sound like Walt Disney characters. There are a number of members on this board who would be considered qualified to present an educated opinion. But, really the book we've been using is the source for classifying fingerprints. It really is pretty self explanatory. Remember the FBI classified Walt Disney's fingerprint as a tented arch. They had the actual finger in front of them. They also had the original print, not a 2nd hand photo copy that has been zoomed. I trust their trained eye. Richard Unger also saw it as a tented arch. This could have been because of the notation on the FBI's prints or he also has a copy of "Lion Paws" with the lithograph. A lithograph is a print that isn't made up of multiple dots. It's as close to the original as we can get in printing. Students of his are members of this board. If you simply follow the rules from the book and study the examples, you will have the same information available to Martijn and myself. In most case it's not a subjective matter. Figures 145 to 148 are tented arches because of the angles formed by the abutting ridges at the center of the patterns. Figure 155 is a plain arch because it is readily seen that the apparent upthrust A is a continuation of the curving ridge B. Figure 156 is a tented arch because ridge A is an independent upthrust, and not a continuation of ridge B.
I think this in particular example you can see that another of your above mentioned theories doesn't hold water either. Notice how the upthrust is not connected to anything at all? Both your gold and green upward curving lines fit this description. 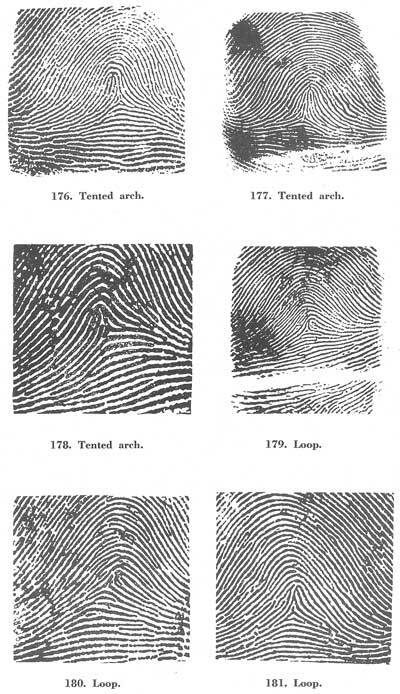 I believe I have addressed and discounted all of your theories and hopefully have drawn your attention to additional tented arch information in the "The Science of Fingerprints". I do believe the hat creates the appearance of a tent in the middle of a curving horizontal plane...don't you? Or is it just an illusion?